This is not for those who trade longer timeframes. If you trade the 15 minute chart or higher then you should NOT be aiming for constant screen watching all day. Set alarms to monitor price on completion of each trading timeframe candle. And price alerts to bring your attention back to the charts at key levels. If you trade the 5 minute chart, perhaps you'll want a blend of the two. Alerts when price is well clear of potential setup areas. Screen watching only when there is potential for trade opportunity. But below 5 minutes, you'll likely want to spend considerable time watching the price movement. And for you, it's important that you develop a plan to achieve peak-performance levels of focus. Let's start by reviewing one of the key ideas in the article on discipline. In that article, I suggested that you can't "get more discipline". Discipline is actually an outcome. And it comes about through effective HABITS and STATE MANAGEMENT. The same applies when we think about focus. Focus is not something you can just get more of. Again, it's an outcome. And it comes about through HABITS and STATE MANAGEMENT. We aim for habitual use of processes in our pre-session, during session and post-session routines, in order to establish a focused state. And to return quickly to the focused state if our mind should start to wander. And we aim to place our body, mind and soul in as much of a peak-performance state as we can, in order to best maintain effective levels of presence, awareness and FOCUS. So let's split this article into two parts, turning the idea of "focus" into a daily habit, and then ensuring effective state management. There is nothing I've found more powerful in kick-starting my daily habit and ensuring disciplined focus than the power of intention. This is a documented part of my pre-session routine. It is simply a verbal statement of intent that "Today I WILL focus on the charts. I will not allow myself to open my browser for any non-trading purpose". That is obviously set up for my most common distracter. "I'll just have a quick look at email and social media." Adjust the statement to suit your own needs. But be sure to give it a try. I can confirm through having monitored this as part of my review process, that days which begin with a verbal statement of intent are typically more focused than days when I did not make the statement of intent. This is used during the session, whenever I have caught my attention wandering. Every 30 minutes I check my personal state. This includes an assessment on how effective I was in maintaining focus. If particularly good or bad, I'll jot down some notes. These then feed into the post-session review. And if poorly focused, it's back to the statement of intent and the focus statement (above). I don't always use a focus alarm. I find if used continuously that it tends to just disappear into the "background" after a while. But from time to time, in particular if slightly fatigued, it has helped. It's simply an alarm that goes off on the close of EVERY trading timeframe candle. It sounds a bit extreme. But it works. You can of course set it for longer if you prefer. Or shorter. But it acts as a "wake up" to not only shock me back into focus if I've slipped away again, but also allowing me to "update" my market analysis with this new candle information. I use SnapTimer, but there are dozens online if you don't like it. 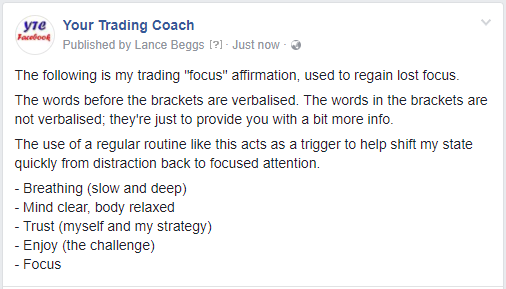 The 30 minute notes on your ability to maintain focus are pointless if you don't review them. And then, if you were not particularly effective, aim to identify why and find a way to improve tomorrow. Your mind cannot be focused if it's surrounded by multiple temptations or distractions. The mind is NOT a multi-tasker. Remove all distractions – social media, internet, phones, pets, kids, and whatever else acts to take your attention away from the charts. For web browsers, you can find apps which block access to them during preset times each day. Keep one browser available though (not the one you usually use for surfing). If your platform goes down or you get other tech issues, you're going to want some way of getting online quickly. Set a minimum standard for rest. And stick to it. There's a water bottle just off to my right. Always accessible. Get one for your trading room if you don't have one. This kind of goes without saying. If you struggle with focus, exercise better and eat better. Simple! You will notice improvement in all areas of your life. I have regular breathing routines from back in my Tai Chi & Chi Gung days. If you don't, Google search it. Find some exercises to relax the mind, body and soul. Coffee pre-session. To be honest I'm not sure on the science of this one. It is effective for me, given the night hours I trade. But not too much. One a half-hour before trading seems to help me. Give it a try. Chewing gum, while not exactly a stimulant, seems to work well in dissipating any nervous energy that can act as a distraction. Always aim to spend a few minutes every half hour AWAY FROM THE DESK. Get up. Stretch. Go for a walk. Whatever you need. Just get away from the charts to reset your mind. Consider incorporating this into your breaks. Nothing gives you a "wake up" quite as effectively as a short, sharp burst of exercise. But experiment with background ambient music, binaural beats or isochronous tones. Or whatever works the best for you. It's a process of trial and error. Add this to your post-session review until you find a number of preferred solutions. I don't have one right now due to the current layout of my trading room. But I've used this in the past to great effect. Seriously, it works incredibly well. Raise your desk. And stand back a bit, out of arms reach of the keyboard and mouse. Step forward ONLY when it's trade time. It's just you and the charts. Absolutely NO WAY to click on that web browser, even if you wanted to. I've yet to see a trader try this but it looks like it has potential. Well that just about wraps it up. 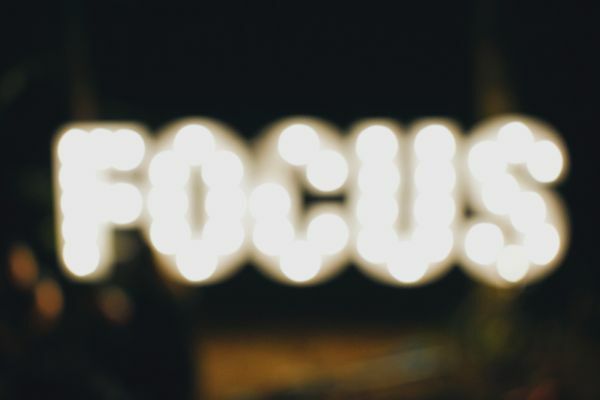 If you have any tips or techniques which you've found effective for improving or maintaining focus, let us know in the blog post comments. I love the SnapTimer, it has everything, ticking sound, alarm (looping one too!) AND a popup which forces me to pay attention. I hope this will do it for me. Keeping my fingers crossed! Yeah, SnapTimer is great. One of the best I’ve found. Thanks Ricardo, All great advice. Especially with regards to sleep. You’ll note I put a link in the article to my fatigue management plan. It is the absolute minimum I accept, in dealing with short-term acute fatigue. 7:30 or more, as you suggest, is the ideal though. And as someone who suffers from time to time with insomnia I can confirm that when the situation shifts more to chronic fatigue, the only solution is a few days off. Thanks again for your comment. Great stuff.